I know what you're thinking -- "MORDY! COME ON! OF ALL PEOPLE, THE LAST I WOULD EXPECT IS A LOOK AT QUARK!". Well, to be brutally honest, I am not only an author of several books on Adobe applications, I am also a consultant for many clients in the publishing sector. And in that capacity, I have to be aware of the technology that's out there. In addition, I have always felt that we -- as users -- need to be aware of the tools that are available to us. Which is why when I received an invitation to attend a QuarkXPress 7 launch event in NY, I marked the day off on my calendar. Today's launch event of Quark 7 (they are also shipping the PowerPC Mac version starting today -- the Universal Binary version will ship this summer) comprised of a keynote session, followed by a hands-on session where I got to play around with the app a bit. 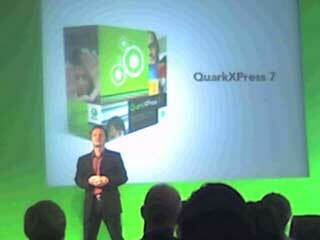 Jurgen Kurz, Senior VP of Desktop Products at Quark gave the keynote and also did the demo. He didn't do that good a job doing the demo, but I give him credit for pulling off such a stunt. Someone like Bruce Chizen or Shantanu Narayen would never attempt a software demo and would instead leave it up to a professional evangelist. Even though it seemed akward to watch, I'll admit it had a Steve Jobsesque feeling. Kudos for standing up for your own product like that. OK, on to the features. Obviously, Quark is touting transparency as the next biggest thing. They claim to have a "smart flattener" that figures out the best settings for each job. In the print dialog, I could only find one setting for the flattener, and that was for a resolution setting. But here's what REALLY gets me. Quark is making a HUGE to do about their ability to apply separate transparency settings to the fill and stroke of a frame. True, it's something that InDesign can't do (although Adobe apparently has "leaked" out that CS3 will have the ability to do so). Of course, this is something that Illustrator has been able to do since version 9. That's over six years ago folks. I'm not saying that Quark doesn't have the advantage over ID here (it does), but in their literature, they do make mention that no other program (and they oddly list both FreeHand and Illustrator in that list) has the ability to achieve this "brand new" ability. YAWN. I'm just surprised that Adobe has kept silent about this. I mean, Quark has been touting this feature for over a year now and no one from Adobe has once spoken up that Illustrator has always done it. While Quark does have Opacity controls and soft drop shadows, they do not offer any of the Blend modes that appear across PS, ID, and AI. On the subject of drop shadows, the controls are pretty clunky, but Quark allows for the skewing of shadows (again, something that Illustrator can do with ease, but ID can't) and you can also choose to have a drop shadow knock out beneath a shape -- which is actually pretty cool and I would find that useful in Adobe apps. The user interface still feels like it's from 1995. They've updated the "palettes" to have the ability to stack and collapse with eachother, but the implementation is extremely klunky and non-intuitive. They've also decided that the Measurements palette (aka, the Control Palette) is the end all and have added tabs to the top of it to allow you to access different settings. Again, the implementation looks like it was just stuck in there and it makes it nearly impossible to position the palette at the top of the screen, if you would prefer that setup. They have something called "Composition Zones" which allow you to cordon off a section of a document and send it to someone else to work on. The theory is to allow multiple users to work on a single document. If you've ever used Smart Objects in Photoshop, it's quite similar in concept in that a section of a document becomes a "miniature" standalone Quark file that you can edit or send to someone else to edit. What's cool is that when someone else edits that zone, you see the update in your document. However, when using the feature myself, I found that once you create a composition zone, you can no longer edit it as a normal Quark element. There were two other items that Quark made a big deal about. One was color management and the ability to preview your files on screen (soft proof) using ICC profiles. The ability to do this is nice, but again, AI, ID and PS have been able to do this since the turn of the century. In fact, I may post about this specifically in the near future. The other item was a Job Jacket feature that allowed users to embed information about the specs of a job into a file or a layout. They demonstrated Quark's ability to scan a document and check it against a profile to see if it matched or fell within the guidelines of the chosen spec. For example, one could check a document while they are designing it to see if it was PDF/X compliant. In my eyes, this is ludicrous. First, while I'm designing, why would I waste time checking compliance? I would do it once I get final approval and make any necessary adjustments at that time. Finally, PDF/X-1a is a flattened format and you don't WANT a flattened document while you are working on it. So while I'm designing, my document will never be PDF/X-1a compliant -- that's the format I expect it to be in when I transmit it to a printer. And if you've been to a transparency class that I've given, you also know that many workflows require unflattened PDF files (especially where trapping is done in-RIP). I don't know -- maybe I'm just not getting what Quark is trying to do here. Oh, and they still have that annoying issue where you need to choose the bold version of a font (or risk the wrath of faux bold). In all, I think that Quark has certainly done their homework. The app is a lot better than ever before, and for those who are still using Quark, the interface hasn't changed much at all and that makes it easy to upgrade. If Quark keeps up the hard work, I think we'll see some really interesting things in the future. But I can't imagine that anyone who has already made the switch to ID would feel compelled to go back to Quark. If you use Illustrator and Photoshop, InDesign still seems to be the best choice out there for page layout. I know that for the kind of work that I do, I'll stick with InDesign and wait it out for the Universal Binary version thank you very much. Strictly speaking Quark's transparency feature is different from Illustrator. Illustrator doesn't allow you to apply opacity or shadows to individual characters in a text frame. Of COURSE Illustrator can apply opacity to individual characters in a text frame. And while you can't apply drop shadows to individual characters in AI, you can't do it in Quark either -- I tried. You have to apply the shadow to all of the text in the frame. And I realized that I can simulate Quark's ability to "knock out" the object shape behind a drop shadow by simply coloring my text white and setting the text object to multiply. As Mordy mentioned, I never had a problem applying opacity or blend modes from the transparency palette to individual characters whether in be in area or point type. While there is no one click solution to make a shadow of a single character, a lot of fun can be accomplished with the appearance palette. I'm the anonymous up above. RE: knockouts, Photoshop can do this, but what about "Knockout Groups" in Illustrator's and InDesign's Transparency palette? RE: single character drop shadows, In InDesign select your character, choose Type>Convert to Outline, then apply your Drop Shadow settings. If you need to edit the text later, it's easy enough to select the outlined characters and retype them, then re-outline them. David - the knockout group option simply keeps transparency active between items within a group, but that transparency doesn't affect objects outside the group. Steve - the event pretty small. The decor was clean and bright and while I don't know how many people were in attendance, it certainly wasn't anywhere near the scale of Adobe's NY launch of the Creative Suite 2.